Blame it on the Voices covered a venn diagram published by reddit user prateekmi2 today which shows the search terms that people use for different religions on Google search. It exposes the different words associated with different religions and the common words are equally interesting. Web Seer is another visualization tool built specifically for comparing and contrasting google search suggestions for two different search terms. I decided to augment the venn diagram above with the web seer visualization – it’s just another way to present the same information. As you can see from the visualization, “stupid” is the most frequent word used on Google to complete the sentence “Why are muslims so …” that is also used to complete the sentence “Why are christians so …”. Other common words for both religions are “intolerant” and “hateful”. On the extremes,the words associated with Muslims are “angry” and “violent” while those associated with Christians are “judgmental” and “mean”. According to this visualization, there is nothing in common between words associated with Jews and Christians, however, the original Venn diagram above found the word “annoying” to be common enough. India is a democratic country with separation of church and state. However, though it’s dominantly Hindu it still hosts one of the largest Muslim populations in the world in terms of absolute numbers. I was curious to see how the two religions compare on Google. There were zero search suggestions for the term “Why are Hindus so …” so for this case I shortened the search terms to “Why are Hindu” and “Why are Muslim”. Unfortunately, there were no words commonly associated with the two religions but it was interesting to see Hindus’ discontent with the movie Avatar and the color of the depictions of their gods. New Google already bested by current Bing? Mashable just reported on the new version of Google by comparing a search for the term “mashable” between the two versions. It appears that they have mixed up the screenshots between the two versions. Correcting for that, here’s their screenshot of what the search results look like on the “new, top-secret” version of Google. 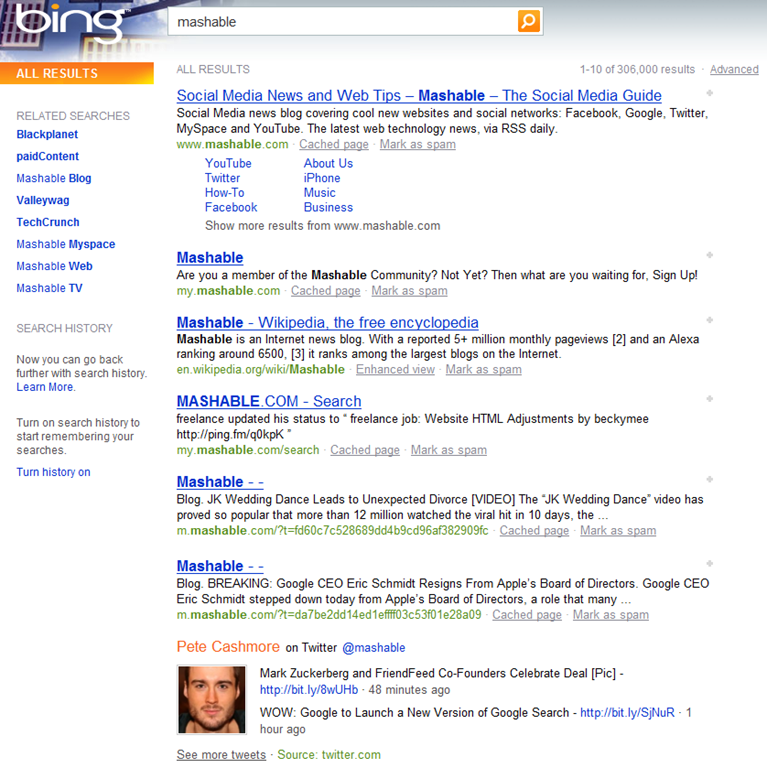 Below that is what the search results look like on the existing public version of Bing. When I search for the word “mashable” I am more likely to be interested in tweets by mashable (bing) than in news articles about mashable (google). Seems to me that Bing has a superior results page than Google. It’s real-time enough to also capture the very tweet that mashable made about their story. Update: November, 2008 less tha n6 months after starting the project, Google pulled the plug on this.